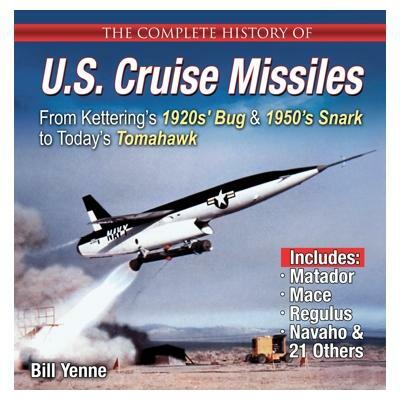 Employing a considerable archive of U.S. cruise missile data and material amassed during his extensive research, author Bill Yenne has created a compelling work containing a wealth of previously unpublished photographs plus detailed technical information that is simply unavailable in any other product on the market today. The year 2018 celebrates the Centennial of US Cruise Missiles. In 1918 Col. Hap Arnold, future father of the U. S. Air Force, was sent overseas to France to prepare for the operational deployment of vast clouds of unmanned Kettering Bugs to be used against the German Army. This book begins with an overview covering the important subject of long-range cruise missiles, providing readers with a unique look at early programs leading to the development of the first primitive cruise missiles. Highlighted are the 1920s Kettering Bug and combat-proven German V-1 buzz-bomb used with such devastating effect in World War II. Covered next is the exciting first generation of U.S. turbojet-powered, long range, supersonic, winged cruise missiles, such as the Matador, Mace, Snark, Regulus, and Navaho, all of which bore the brunt of U.S. deterrence during the critical years of the Cold War in the 1950s. Having appropriately covered the history and development of cruise missiles, the focus shifts to today's premier strategic weapon system, the BGM-109 missile that effectively checkmated the Soviet Union and ended the Cold War. In-depth text describes how this highly advanced winged vehicle evolved to become the world's primary operational unmanned weapon today, with the Tomahawk family of cruise missiles currently numbering more than 3,000. Detailed, yet with easy-to-understand text, this book explains how and why this weapon was developed and is still being utilized in an impressive ongoing combat career.